Witness to a murder in a deserted highway rest area, dull and drab Bethany runs from the killers when the victim warns her to “trust no one”, changing her complete look and personality in her attempt to hide. Bethany takes on the challenge of finding the victim’s son to deliver the documents as he asked with his dying breath. Can she stay ahead of the men seeking to stop her? Meeting the victim’s son, Roger, she realizes quickly that she needs his help to find the mastermind and survive the attacks of the killers on her trail. Her new saucy appearance gives her needed courage to chance her heart on the rugged rancher. Can they find the villain before it’s too late for her? Will the heat of their chemistry mature into a stronger emotion? Bethany uses her sport of Endurance Racing, hiding in ride camps, traveling with other riders to stay hidden from the killers. 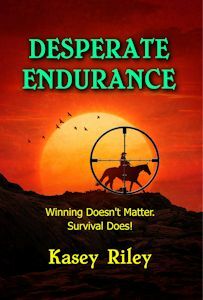 Will the speed and endurance of her horses save her from the mastermind when she’s force to race to the safety of Roger’s arms? Step into rural America and the sport of Endurance. People standing together to protect each other and riders who close ranks against outsiders if one of their own is threatened. This book honestly portrays those who live far from city streets and those who ride rugged trails at speed for the fun and challenge of the event.